There are so many rules when you are a husband and a father. 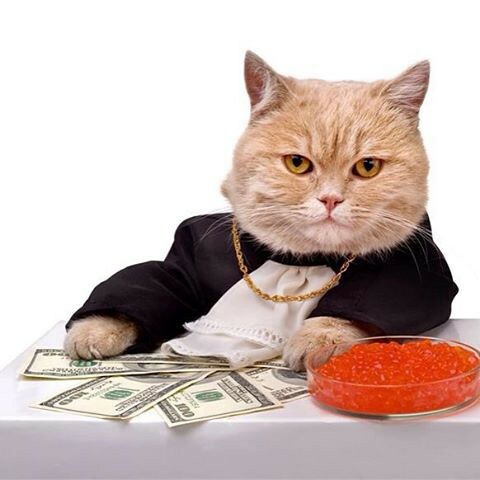 Do you want to be as rich as this cat? Preface: I’m throwing this idea out to the universe for free. It’s no doubt the next Silicon Valley unicorn so go ahead and run with it. Just let me know when it’s ready, because as a dad, I could use this yesterday. My wife works late most days, so from 5–7pm, I’m on daddy-duties. This is an important chunk of solo-parent time where I give my daughter 100% of my attention. We laugh, run-around, play, read books, and more importantly, spend time together. In fact, I have this time blocked off on my calendar. Unless you’re my wife, I won’t pick up or look at my phone (emergencies pending). For these two hours everyday, I mentally check out of email-land and check into fostering my child. Like my wife, my 2 year old has a giant personality, and of course, sass. She started walking and talking early, so we’re hoping after preschool, she lands a job at a cool start up — I mean, somebody’s gotta pay the mortgage, right? Jokes aside, even with my wife’s strong genetics, I have to remind myself that she’s still my little baby and figuring out the world one day at a time. Earlier this summer, during one of our daddy-daughter moments, I was exhausted from trying to be an adult with responsibilities, so I thought a good way to give both of our brains a boost was to make one of my famous berry smoothies (shout out to Vitamix and blueberries in general). She was old enough where I thought she could handle a cup with a straw like a “big girl”. After repeatedly telling her to use two hands, and her nodding that she understood this new drinking procedure and workflow, I turned to get a straw from the drawer. I turn back, and in literally 2.9 seconds, she is dripping purple. So after 20 minutes of wiping, changing, and getting the situation under control, I quickly checked the fridge, crossing my fingers in hopes that somehow a lost Lagunitas IPA was hiding behind the milk, just waiting to jump out like a high-school cheerleader with spirit-fingers. You open the app on your phone. After placing your order (Basic Chaperone Package), a certified, and sober, beer chaperone in your area will come to your house. They will deliver, and watch you drink, 1 beer of your choice while also entertaining your toddler for a 30 minute window. The chaperone is required to listen to you while you share your dream about how you should have bought that boat in 2014. The chaperone will also tell you how your dream of becoming a filmmaker is valid and give you compliments on your beard. Additional 30 minutes of chaperone-time can be added if more compliments are needed. Your CC will automatically be charged. Like Uber, you can see a map and eta of your chaperone. After 1 beer, and 30 minutes of conversation, the dad has the option to order a 2nd and final beer. Important Product Note: the chaperone will only have 2 cold beers on hand. 2 beers is the limit with this service since there is a baby involved (come on, we’re not sloppy fathers. We’re just stressed out of our minds). Once this order is placed, the chaperone is required to call the wife. Beer 2 will not be given unless permission from the wife is requested. There will be lots of yelling on the line (obviously), so the chaperone is trained and required to share details of the events leading up to this app purchase (ie, smoothie story). Once beer 2 limit is consumed and reached, the chaperone will take away the dad’s phone and wait until the wife gets home. This is to A) supervise and prevent dad from taking the stroller and baby to the closest happy hour, and B) to avoid further yelling by the wife over the phone/text because “it’s Tuesday” and “you’re supposed to be a responsible adult” or whatever. The dad has the ability to pay for this premium package service, whereas once the wife gets home, the chaperone must help articulate face-to-face the reason for why the beer was needed, convince her that it he is making valid life choices, and remind her why she fell in love with him in the first place. Dad has ability to tip chaperone generously if he/she can convince wife to buy a boat. Good idea? Comment and let me know what you think. Follow the shenanigans on Facebook, Instagram, and Pinterest. Or email me directly to say hello!